By 10 a.m. Monday, the event tent and red carpet had been erected on the grand steps of the Metropolitan Museum of Art, and brawny men were unloading utility vehicles stacked with police barricades, lining them up to protect the world-famous glitterati who will floss their GlamGlow-glimmering visages and stylist-groomed gowns in a few hours. Crossing guards, draped in city-issue neon vests, had the unfortunate task of informing tourists that the museum is closed today for “a special event,” directing foot-traffic across the street. A floral-painted arch welcoming revelers announced the theme of the evening’s Met Gala and its accompanying exhibit: Rei Kawakubo/Comme des Garçons: Art of the In-Between. There’s a dissonance to the fact that the Met Gala, fashion’s highest-echelon event, is being staged on May Day, when workers and immigrants are marching across the city for basic rights to work and exist. Tickets for wealthy donors come at a cost of at least $30,000 (assuming one procures an invitation)—that’s more than the total median income for parts of the Bronx and slightly less than Brooklyn and Queens—though it is a fundraiser for what appears to be an ailing institution, one that is currently weighing the fiscal decision of charging for admission (it currently operates by donation and public funding). The fact of the Met Gala, that it is a chance for philanthropists to rub elbows with celebrities and Anna Wintour, is that it is a glamorous party that is only tangentially related to the annual Costume Institute exhibit it celebrates—this year, the true Japanese visionary/artisan Rei Kawakubo and her hyperbolically influential label Comme des Garçons. That Comme is one of the most important projects of the late 20th and early 21st centuries and A-listers are scheduled to hit the Met Gala carpet wearing brands like H&M and Versace is testament to that: it is a party about fashion, with a theme based entirely to celebrate the museum show. In the era of brand sponsorship and constricting creativity, perhaps the gala and the exhibit are separate, ahem, intellectual pursuits. But within the exhibit, which I previewed today with a phalanx of fashion icons (Suzy Menkes, Grace Coddington), hyper-normie editors (myself), gallerists and impeccably dressed CDG acolytes, there is another message, and one that is not necessarily at odds with the populace protesting in Union Square, whatever the Met Gala’s luxe reputation may be. The exhibit itself, made possible in part by the existence of the Gala, is exquisite and a long-overdue elevation of one of the most creative minds of her generation. Kawakubo’s pieces wind through a stark white structure especially constructed for the exhibit and more open than any other Costume Institute exhibit I’ve ever seen, a procession of astonishing pieces organized by hue and mood and, more broadly, theme: the “in-between” of the title refers to her ability to explode the question of whether art is fashion, discarding it for the false dichotomy that it is. Kawakubo’s lace mourning veils and bulbous gingham dresses are sculptures as much as they are functional garments, and through each piece she asks the viewer (and the wearer) to answer a question about who they are, who we are, and most specifically what are our values. Will we adhere to the reductive binaries imposed upon us because they are easy, or are we interested in standing for something deeper? What is the fire within? Object/Subject: Body Meets Dress—Dress Meets Body, Spring 1997. 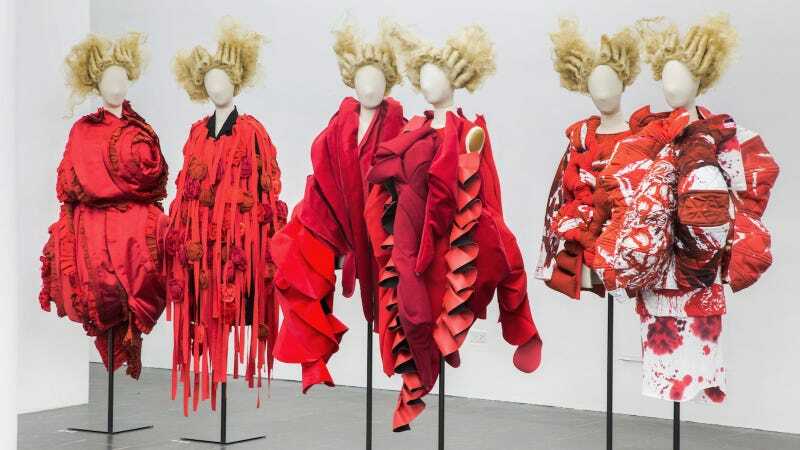 For Kawakubo, creation is linked to defiance and a frustration with the status quo: “Many times a theme for a collection arises from a feeling of anger or indignation at conditions in society. The origin of an idea is found in not being satisfied with what exists already.” At the same time, she has said, “I have no desire to make my own designs into messages addressing the issues of our world.” When it comes to the zeitgeist, she tends to engage with it symbolically and conceptually. Kawakubo’s disinterest in standing on either side of the political divide is not, I think, a lack of perspective but more a rebuttal, again, to the expected adherence to it; in her most sanguine pieces, like the blood and roses pieces (seen at top), strife is represented both abstractly and literally, and in allowing the viewer our own interpretation, more powerfully than if she had told us their meaning outright. This perspective is most resonant in the Birth / Marriage / Death section of the exhibit, which showcases some of the most emotionally moving garments I’ve ever seen up close. The delicateness of beige lace, draped and sewn in such a way that it resembles weeping willows, seems to weigh a thousand pounds; an egg-shaped, black lace frock from Fall 2015 represents a Victorian (goth) mourner, but somehow seems freer in its anonymity—we don’t know what the wearer is doing under there; maybe reading a book with a flashlight.